The reception area. All photos are courtesy of the resort. 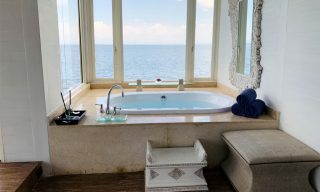 Macau may have taken a beating with a recent typhoon, but life goes on for this one-year-old resort. 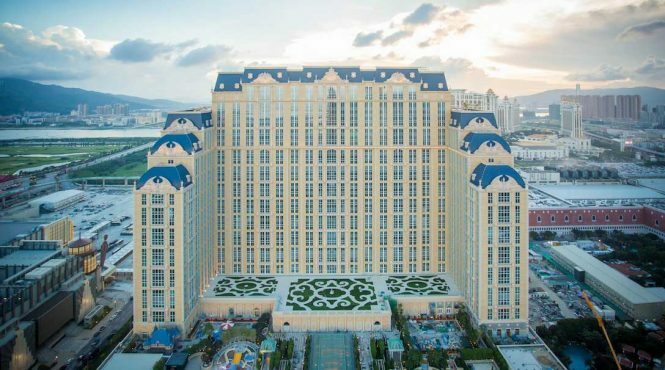 Walk through the doors of this 3,000-room property in the city’s Cotai Strip and you’ll be instantly reminded of the French capital. It takes its cue from many of Paris’s beloved landmarks—no surprises there considering its name. The Rotunda, the hotel’s main lobby, is a nod to the Palais Garnier, the home of the Paris Opera. Flanked by hallways of French limestone and marble, it’s also reminiscent of Cathedral of Saint-Louis des Invalides with its trompe-l’œil dome at the centre. 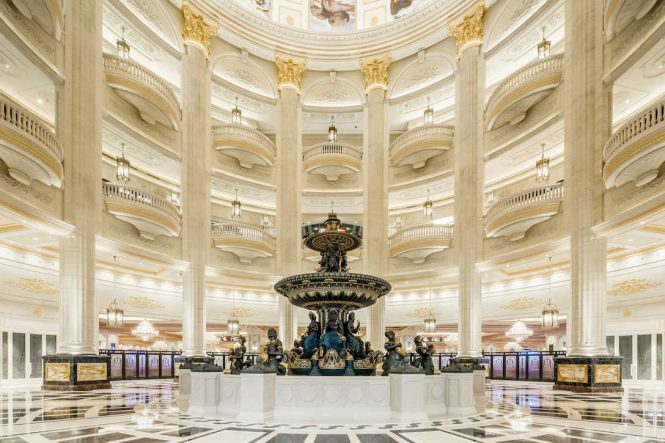 Another key feature of the lobby is a replica of the Fontaine des Mers, the fountain added to Place de la Concorde in Paris in 1840 to commemorate France’s maritime trade and industry. Large figures of sea gods and mermaids made of cast iron and painted in bronze and gold are placed on the prow of a ship, the symbol of Paris, and are surrounded by dolphins, coral, and fish. 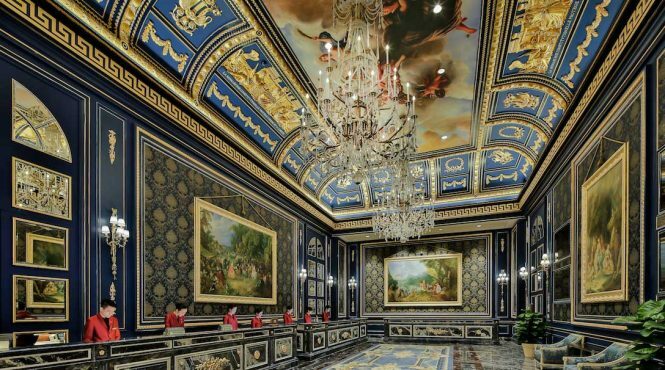 Walk to their opulent marbled reception area, a recreation of the historic Apollo Salon at the Palace of Versailles. 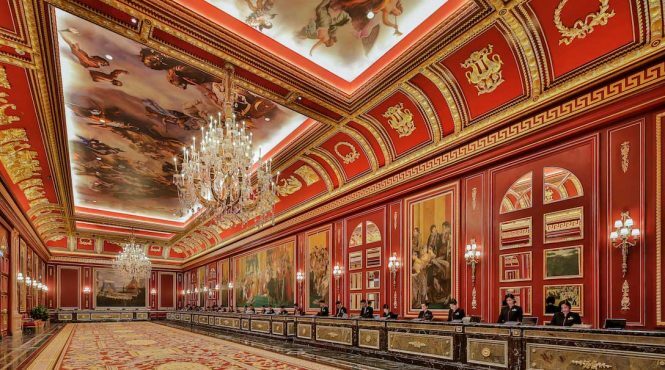 Crimson walls, frescoed ceilings, and faux period rugs round up the overall look of the space, which receives a large throng of guests looking to spend their money at the craps tables during the weekends. 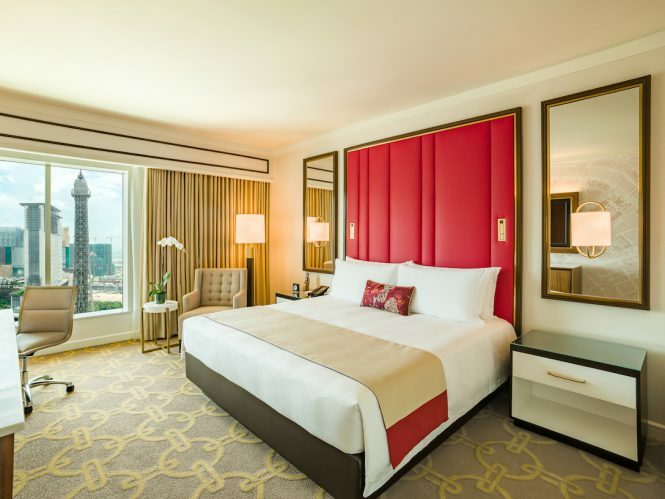 Perhaps because it’s considered lucky in Chinese culture, red was chosen as the recurring theme in most of the rooms, which come in four categories. The 33-square-meter Deluxe, Eiffel, and Famille rooms differ in configuration and view. 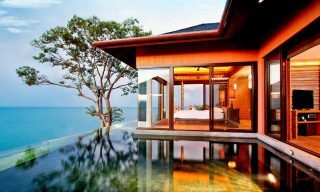 The first and second come with crimson leather-fitted headboards, a king-sized bed or two queen-sized beds. Meanwhile the Eiffel room overlooks the property’s half-scale replica of Paris’s most famous tower of the same name. Families with kids in tow can stay at the Famille room, which comes with one king-sized bed and a children’s bunk bed. Cute beanbags and a chest of toys make the room welcoming for curious, younger guests. 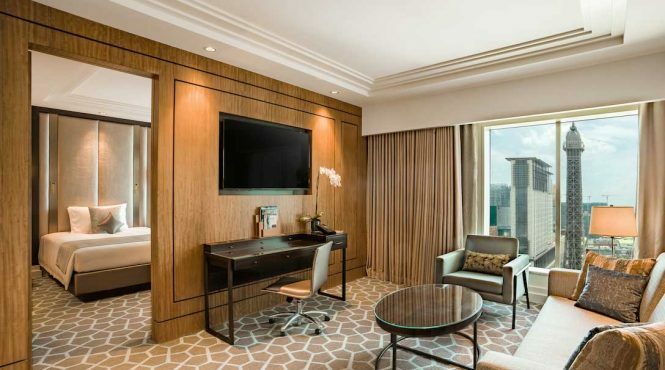 Meanwhile, the 72-square-meter Lyon Suite is a one-bedroom space with sweeping views of the hotel’s lush gardens or the Eiffel Tower. 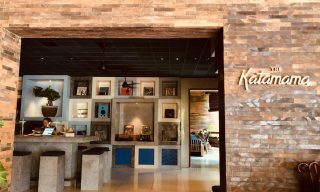 For those who refuse to be cooped up inside their rooms, the hotel’s five heated pools and three Jacuzzis offer a welcome break from the crowded casinos. 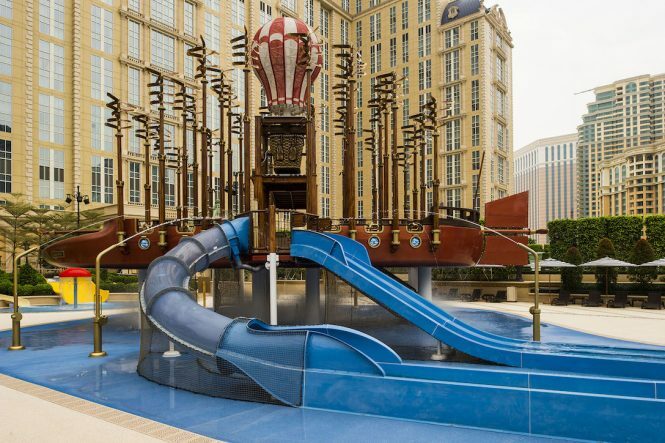 Parents can leave their tots behind at Acqua World, a water-play area marked with spiral waterslides and a recreation of the hot air balloon from Around the World in 80 Days. Selfie-seekers will not be disappointed to know that the Versailles-inspired manicured gardens and the replica of Montmartre’s Moulin Rouge will provide better-than-average backdrops for their photos. 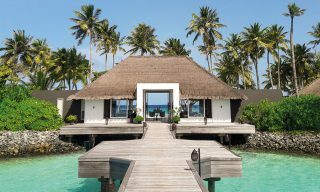 When all else fails, head over to the 12-room Le SPA’tique for an hour or so of luxury treatments. 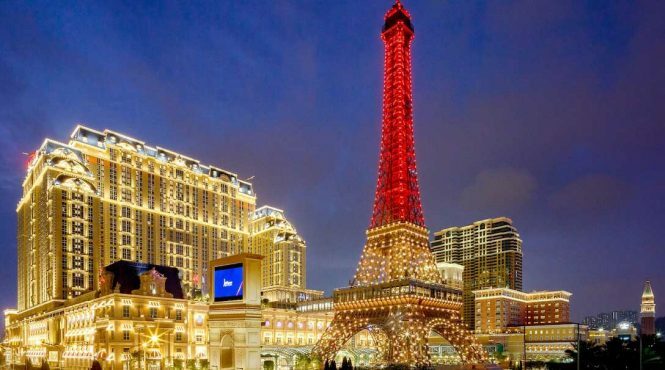 Just as one doesn’t visit Paris without seeing the Eiffel Tower, a trip to The Parisian wouldn’t be complete without a tour of its own version, said to be the tallest and most realistic replica in the world. It took a year and 2,800 tonnes of steel to recreate Gustave Eiffel’s 1899 masterpiece. 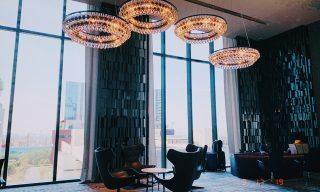 For scintillating views of the Cotai Strip, the seventh and 37th floors are where you should be. Watch the spectacular lights and sounds show that occurs each hour, or simply soak in the brilliant sight of thousands of lamps that illuminate the city.